An overview of prostanoid synthesis pathways. Free arachidonic acid can be metabolized to PGH2 by COX-1 and COX-2. NSAIDs inhibit activity of COX-1 and COX-2, whereas COXIBs inhibit activity of COX-2. PGH2 is sequentially metabolized to PGI2 by PTGIS, TxA2 by TBXAS1, PGE2 by PGES, PGF2α by PTGFS, and PGD2 by PTGDS. 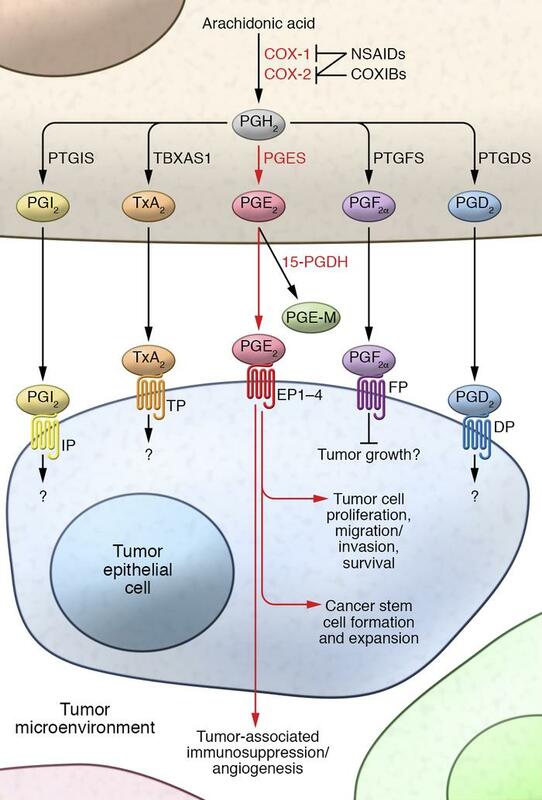 PGE2 binding at EP1–EP4 receptors is known to promote cancer development via multiple mechanisms (described in detail in the text and Figures 2 and 3). The roles of other prostanoids and their receptors in gastrointestinal cancer remain unclear (also detailed in the text).